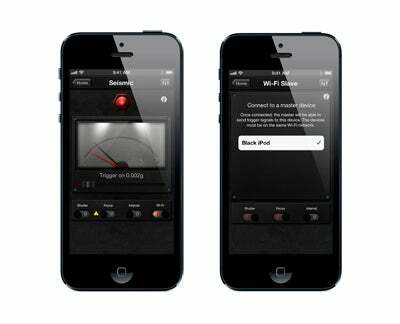 Triggertrap has announced that its Triggertrap mobile for iOS devices now supports wireless functionality via Wi-fi networks. With Triggertrap Mobile’s exclusive new Wi-Fi triggering mode, it’s possible for photographers to trigger their cameras via a Wi-fi enabled ‘slave’ device that communicates with the camera through the Triggertrap Dongle, while controlling the camera functionality from a master iOS device. If you’re wondering why two devices are required to fire the shutter wirelessly, it’s because the Triggertrap Dongle is not Wi-fi enabled. Instead it translates the audio headphone signal from a smart phone or tablet to an electrical pulse that in turn triggers the shutter. To trigger the dongle that’s connected to a device you’ll need a wireless transmitter – thus the reason a separate device is required to talk to the device that’s connected to the camera. What’s more, photographers can also wirelessly connect multiple cameras to the same master device, and in areas where a Wi-Fi network may not be readily available, a personal hotspot created through the master device’s data network can be used as a substitute. In addition to its standard remote shutter release, Triggertrap Mobile offers more than a dozen creative triggering functions for digital cameras, all of which can now be controlled wirelessly. Beyond its four wireless remote trigger styles, the Triggertrap Mobile app also includes multiple time-lapse functions, facial recognition, motion detection modes and a star trail mode. The Premium Triggertrap Mobile App can be purchased on both iOS and Android devices for £2.99, while the Triggertrap Mobile Dongle can be purchased for £16.